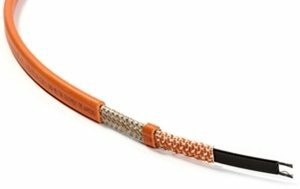 Snow and frost melting cable 300 W/m in concrete at 0 Deg C.
The self regulating EM2-XR cable automatically adjusts its power output in accordance with ambient conditions; more power is produced in harsh freezing conditions and less power in marginal freezing conditions. It can be cut to length onsite providing complete flexibility in installation. It can also be provided as a configured heating unit to meet your specific design requirements, including pre-installed terminations and power cable. Safe with overheating not possible, even when crossed or closely spaced. Robust cable resistant to damage during installation. Maintenance free as there are no moving parts.